Faith XLVII's 2018 Skid Row mural "Salus Populi Suprema Lex Esto"
Faith XLVII settled into her new Echo Park studio less than a month ago, but it already looks as if she’s spent her career here. In one corner is a growing collection of wood paintings of animals with some mystical references that will be part of a forthcoming solo show. Elsewhere, there are collages, screen prints, and more paintings, an eclectic mix of works all from the mind of the same artist. Previously known as Faith 47 (she made the change from Arabic to Roman numerals “a year or two ago” because she liked the look of it), the South African artist known for her work in the street-art realm relocated from Cape Town to Los Angeles a year ago. “I wanted to be in a place where I could expand my practice,” says Faith. And Los Angeles has made an impact on the artist. “I think I’ve become a lot more focused,” she says. Faith spends the bulk of her days inside the studio and will keep at work until midnight or 1 a.m. Often she’ll have assistants come in to help her out during the day. The afternoons can be sluggish, but by the time evening falls, she’ll start blasting music and getting back into the work. Her practice now incorporates everything from painting to video installations to immersive art. She’s a prolific artist and one whose works cross disciplines and themes. Sexuality, borders, peace, and environmentalism are all topics Faith has explored in her work. 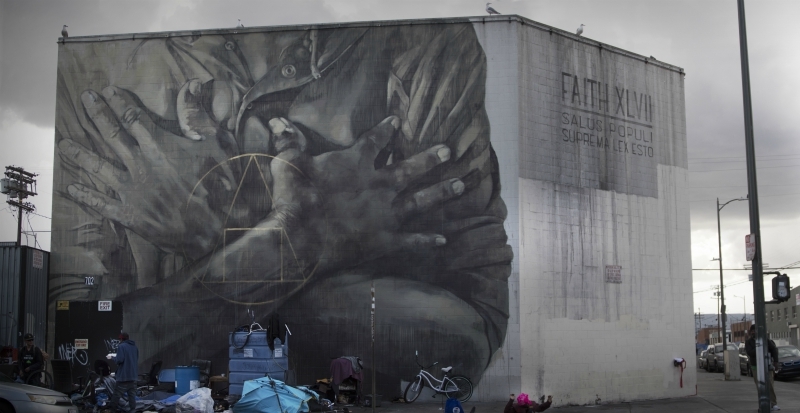 Recently, Faith painted a large mural in Skid Row. Titled “Salus Populi Suprema Lex Esto,” the piece features the arms of a person crossed over the chest. It’s genesis stems from a video collaboration that Faith did with Chop ’em Down Films in Jacksonville, Florida, called By Virtue Of, where homeless people were interviewed while their hands were filmed. The resulting footage was screened on the side of a building.